Home » Current Affairs » Australia’s problem with latent racism. What, exactly, is the Reclaim Australia group trying to reclaim? As tempting as it might be, it would be foolish to brush off Saturday’s protests as actions from an outlying lunatic fringe. They are lunatics, to be sure, but the fact is that many average Australians are feeling increasingly insecure about their place in the world, as the realities of increased global competition set in. During 2015 we’ve heard anxieties about ‘cashed up Asians’ pricing young people out of the housing market, we’ve experienced the realities of jobs moving offshore, and the harsh truth that the market of skills in various industries is making it increasingly tough to secure employment. We should not be surprised. In a country that treats education as a formality rather than a privilege to be valued, is it such a shock that we’re being out-priced and out-skilled by migrants who have worked harder, worked longer, and have valued the opportunities afforded them? Rather than placing ourselves under the microscope and asking hard questions about our complacency, feelings of blame and resentment manifest in the ugly demonstrations we saw last weekend. Unfortunately, this transcends to our suburbs, where quiet insecurities and prejudices hide behind closed doors. To be blunt, Australia has a problem with latent racism, and it is fueled by our fear of change and by our insecurity in the face of global competition. How many times have we heard a conversation start with ‘I’m not racist but…’? The disclaimer is usually followed by the usual sentiments verbalised across dinner parties in Melbourne’s outer sprawl. Islam is a dangerous religion unwelcome in Australia. Muslims ‘seek to change our way of life,’ and they should love it or leave it. We wouldn’t be allowed to do this and that in their country. On Asians? The usual charges apply. They have a poor grasp of the English language, and they buy out Australian land. Does any of this sound familiar? What is it that makes regular, usually decent people harbour attitudes so contrary to basic decency? Fear. Unfounded fear, and it’s a most dangerous social force poisoning Australian discourse. It’s a curious social experiment, but ask many people if they think life is getting better or worse, and despite the most astounding advances in science and technology, many will respond that life is getting worse. It’s fear of loss, fear that ‘our way of life’ will change for something we are unfamiliar with. Yet it’s founded on something so abstract that it can’t see to reason and logic. When one presses the question on Australia’s ‘way of life’, it’s very difficult to receive a straightforward answer. What is this way of life, exactly? What is it that we’re so scared of losing? I’ve asked this question several times, and I’ve never received a satisfactory response. The banner words are there: freedom, tolerance, mateship. Yet there’s nothing coherent that offers a reasonable foundation for the fear so many feel. 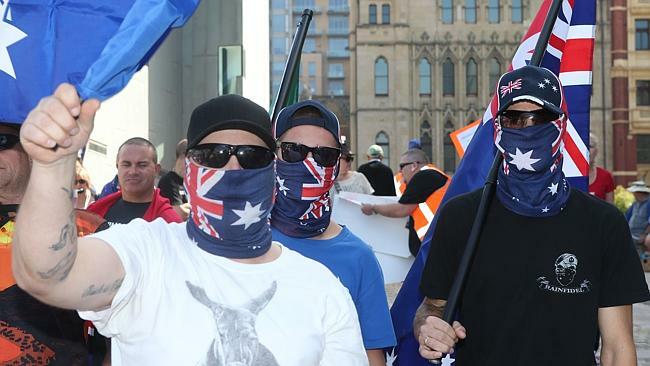 The obvious quandary is the fact that those often mentioned values of freedom, tolerance and mateship are being challenged by the very attitude proponents of the ‘reclaim Australia’ group harbour. In fearing change forced by migrants, many Australians are the very product of the challenge they so fear. They are contributing to the breakdown of the social fabric that makes our country great. My fear is that many of us are hiding behind these banner words. The ‘our way of life’ sentiment is a suitable cover for our latent, nastier feelings. Many of us are scared to reveal our true selves. We are most fearful of the sad reality that perhaps we are not inherently good. It’s not our way of life, but it’s simply the fact that we don’t like what is different. Out there in the suburbs, there are many Australians who shield behind social spin rather than blatantly say that they want to keep Australia white. They don’t want refugees because of where they come from, and they are simply comfortable with the happy Anglo-Australia they have come to know over the generations. Not many will openly say this because they are fully aware that it is socially unacceptable, but it’s what they are feeling deep down. The dominant culture is what’s superior and anything that represents something different to that is unwelcome. We tell ourselves that we are tolerant, but only of what we know. These feelings manifest in what we saw this weekend, when Anglo-Australians sort to reclaim their version of Australia that they cannot define. 8 Comments on Australia’s problem with latent racism. Have you seen France. 56 no go zones for the police. The UK. Muslim only areas. Belgium. Will be the first country in Europe. Under. Muslim. Control. And you call Australians. Racists. No their more patriotic. Than you will ever be. This is obviously written by a lefty journo! Didn’t do any really investigating before reporting! If you want to know what ‘Reclaim’ are so called reclaiming, look at their Perth facebook page. It has nothing to do with a white Australia. If you attended the rally to see what they are about, you would have heard speeches from many nationalities. This whole comment seems unwarranted and eccentric. Firstly, where does he lie? Secondly, if you want to argue your point (which i have no idea what it is) argue it correctly, rather than just slander a writer with no evidence to your claims. You missed one very important item in your uninformed and biased article, Reclaim is multicultural, take the time to look at the faces of the people who were brave enough to face the violent left cowards and you will see people from all races which is the fabric of modern Australia. I cant think of a single country where there hasn’t been problems with multiculturalism !! multiracism works fine but when you start pushing cultures together eventually they clash !! these protests are only gonna get worse and worse because some races wont accept our culture !!! Approximately 2% of Australia is Muslim. Not exactly a take over is it.